On Friday our 2005 reunion was privileged to honor the 317 th World War II veterans with a ceremony held at the Pope AFB Aircraft Memorial Park. The 39th , 40th , 41st and 46th Troop Carrier Squadrons of the 317 th Troop Carrier Group called themselves the ‘Jungle Skippers'. So it was only fitting that the ceremonies be held where the Jungle Skipper C-47 sits in the park. The ceremony opened with the posting of the colors by the Air Force Honor Guard and singing of the national anthem. U.S. Army Chaplin Col. Gustaf Steinhilber gave the invocation and 317VG Pres., Bill Lloyd, introduced Lt. Col. Polly Montgomery, Commander of the 41 st Airlift Squadron, who extended a warm welcome to our veterans and their families. Then Jim Timmons, 317VG Vice Pres., gave a brief history of the WW2 Jungle Skippers.. After this, 317VG Chaplin, Hank Winters, read the names of the Jungle Skippers who lost their lives during the war. This was followed by a 21-gun salute; Taps and a C-130 fly by. A wreath was placed near the C-47 by those Jungle Skippers who were present at the ceremony: Jack Glick, Glenn Lee, Bill Swart, Lawrence Watts, Jr., Wilbur McCartha, and Vincent Marold. After the ceremony, the veterans attended a briefing at squadron headquarters given by Capt. Sarah Santoro, bringing us up to date on squadron operations. The 41 st had been deployed to the Middle East and was soon to be sent there again. The presentation ended with a wonderful video of the squadron in action, created by the men and women of the squadron. A lunch, which featured delicious North Carolina Barbeque, was served after the briefing. Then our group was given a tour of the C-130 maintenance shops and of the aircraft. This was a real thrill for our vets. Saturday morning was spent by most of our vets touring the Airborne and Special Operations Museum. This museum has a lot of military history on display, some of it involving the 317 th , who flew many of the WW II paratroop drops in the pacific theater of operations. The Saturday evening dinner/dance was an extra special event this year. The 41 st Airlift Squadron from Pope AFB attended both the dinner and the dance. Since they were scheduled to return to the Middle East in mid-October, this was a good opportunity for them to have a night out with their spouses. They called it Christmas in October! From the 317 th Airlift Group, Dyess AFB, Lt. Col. Lee Flint, Commander of the 39 th Airlift Squadron and men and women of the 40 th Airlift Squadron also joined us at the banquet. What a great honor it was to have the 3 squadrons back together with the veterans. We sure enjoyed their company and they sure can cut a rug when it comes to dancing. Dave Davenport, a C-130 artist, donated some of his art work for a raffle, which raised $820 for the Air Force Aid Society Hurricane Relief Fund. This money was designated to benefit our service men and women and their families who felt the wrath of Hurricane Katrina at Keesler AFB in Mississippi. Our Farewell Breakfast was held on Sunday morning, where goodbyes were said to old and new friends alike. Our Fayetteville reunion will certainly be remembered for years to come and many thanks belong to Mr. George Banks, our 2005 Reunion Chairman. He did a lot of the leg work in setting things up, and behind the scenes organizing that made the reunion turn out so well. Our hats are off to you George for a job well done. We also owe many thanks to the 41 st Airlift Squadron and the Pope AFB Protocol Office, Anne Niece, for their tribute to our WW II veterans at the Friday ceremonies. 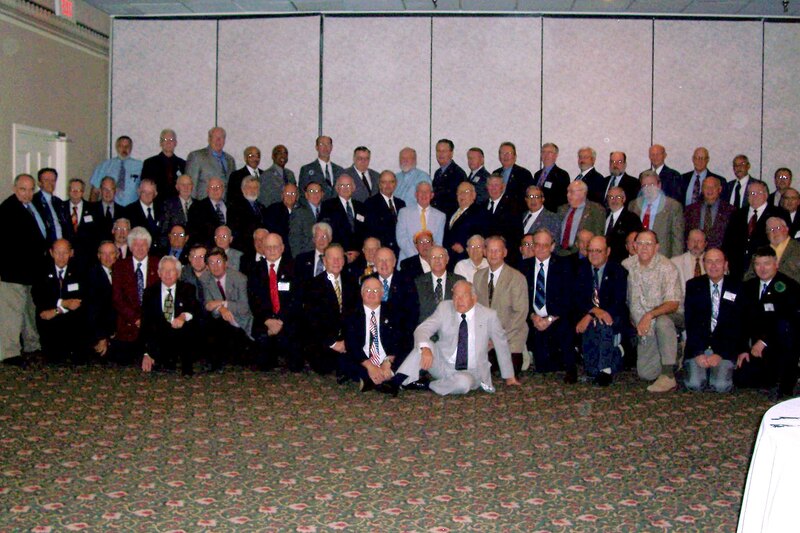 St. Louis, MO was selected as the site of our 2007 reunion and Mr. Mike Heilman has agreed to chair the event. There is a lot to see and do in St Louis, So as the song says, “I'll see you in St. Louie”.